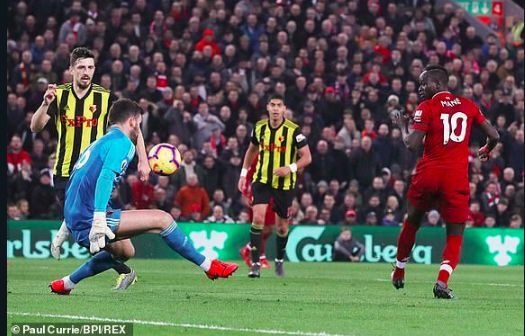 Ben Foster has taken to Instagram to weigh in on Sadio Mane’s wonder goal against Watford on Wednesday night. Responding to a post by the Premier League on the social media platform, he said: “I still can’t believe he back-heel chipped me“. Credit to Reddit user BaronThundergoose who noticed the funny comment and posted it to the Liverpool FC subreddit. Don’t worry Ben, we can’t either! It was truly an outrageous finish by our Senegalese star. The goal arrived in the 19th minute against Watford and was the lads’ reward for piling the pressure on the visitors so early on in the game. Mane spoke to Liverpool FC‘s official website about his goal. “Trent made a very good cross and I was in the box, I was a lucky boy and I scored but the most important thing is the three points and we got it, so I’m happy,” he said. “It was my first time since I came to Liverpool I played centrally. I always said I’m here for the team, so I try to play any position the coach asks me to play to help the team. The three points ensured Liverpool’s place atop the Premier League for another week, with title rivals Manchester City winning 1-0 against West Ham. Our next game is against Everton on Sunday while City have the more simple task of playing Bournemouth tomorrow. Mane’s brace against Watford put him further up the goal-scoring charts – just three goals behind team-mate Mo Salah (17) – an incredible return by our wingers. That means Mane is now ahead of Eden Hazard (12), Raheem Sterling (12), Alexander Lacazette (12) and Son Heung-Min (11) in the race for the Golden Boot. A hat-trick against Everton and Sadio may be tipped to win the award!